You’ve made up your mind. You are ready to do some real exploring, you are eager to learn more about the past and the present; you want an intimate aesthetic experience, a whiff of nostalgia or to see through the eyes of an artist. In the equestrian and military town of Saumur, the Cavalry Museum and Tank Museum offer you a rendez-vous with history. The Motor Museum is especially suited to the technically curious. Lovers of traditions and objects of the past will enjoy the Museum of Old Commerce. In this resolutely contemporary environment, meet the painters or sculptors and discuss their work, enjoy visiting art galleries and artists’ studios. 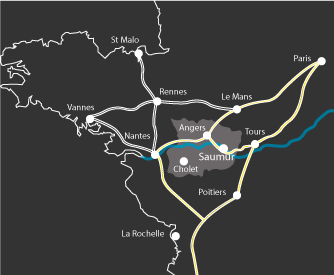 Make the most of the Saumur region, the museums and artistic sites are dedicated to making sure you will! The museum’s collection of nearly 800 vehicles is unique in Europe. The exhibition of 250 vehicles is accompanied by murals, dioramas and period costume settings to allow specialists and amateurs alike to enjoy these characteristic and legendary items. For families, the museum offers a guided tour booklet in the form of a game. Various public events punctuate the life of the museum. Note: dynamic demonstration of certain vehicles during the Model Competition (May / June) and, in particular the Carrousel de Saumur (July). cavalery to the second Empire; from the Third Republic to the modern cavalry. An original collection devoted to combustion engines of all types: from 1818 to the present day. From 800 grams to 21 tonnes, from 1 to 12 cylinders. Restored by enthusiasts, these exhibits illustrate the historical, technical and educational development of mechanical energy. In summer, the museum hosts an art exhibition. To be explored: the Baltard type, metal frame of the building. Housed on two fl oors in the former stables of Baron Foullon (18th c.), this museum has twenty, faithfully reconstructed shops (1900-1950). The little cafe, the milliners’, the grocer’s’, barbers’, hairdressers’... a wonderful trip back in time ! A large selection of old advertising reprints, books, decorative items, rose products etc. in the museum shop. Facing the Bouvet-Ladubay cellars, in nineteenth century premises laid out in a contemporary style, the art centre is the showcase for current creation. Its 9 exhibition halls have hosted such renowned artists as César, Basquiat, Combas, Olivier Debré, Peter Klasen or Gottfried Honegger. In his workshop-gallery, the visual artist Richard Rak displays his work made from modest transformed accumulated objects. Through the 5 halls, the artist questions himself and us on everything that is possible and imaginable. Every summer, the church dedicated to Pope Clement I (Patron Saint of Anjou navigators) hosts an exhibition themed on the history of navigation on the river Loire. Rare objects and unusual documents recall the forgotten story of the ”men on the water”.